Bob Gould, broadcast journalist in-residence at Michigan State University. Editor’s note: This compilation of teaching tips is a companion piece to the author’s essay on what it was like to teach student journalists to cover events that affected the campus community deeply. 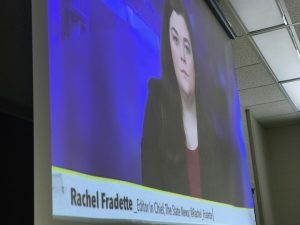 Rachel Fradette, editor-in-chief, The State News appears on a national network to talk about the campus climate during sentencing of former Michigan State University faculty member Larry Nassar. Photo by Bob Gould. We have to facilitate discussion in our class. Make time at least once a week to hear their thoughts, to give them the cathartic, therapeutic feeling. Remember that they often want to talk about this, but do know that this can also trigger emotions, so be mindful of those that may step out of the room. Go back to journalism basics. Don’t be afraid to search for the truth. Minimize harm. Maximize truth. Hold the powerful accountable. Give a voice to the voiceless. Remember the victims in this case and make sure the students have compassion. Be judicious in how you report victims’ names and show their faces. Recommend counseling or support groups that pop up on campus. But merely suggesting isn’t always enough. You may have to bring the counseling to the classroom because often students are afraid to get help. Take time in class to do an emotion check. Students are already over-stressed and suffering from anxiety more than ever before. Adding an event like this to their world is tough, but being a good listener helps. Work hard to overcome biases. The football team and basketball teams have beloved, well-respected coaches that are now coming under fire. Many are nervous that these coaches will be implicated in the mishandling of sexual assault cases. It can be easy to get caught up in sensationalist headlines, but we must look at this objectively and not immediately jump on the national media hype-wagon, nor should we ignore it completely either. Facilitate conversations of what the next story will be and how to cover it. What are the long-term effects? How will enrollment suffer? How are donors and sponsors responding? How will the university alter a culture with systemic, deep-rooted problems? Tell students not to give up. As young journalists, they aren’t the first priority of sources returning calls. Don’t let them get discouraged. If a student is asked to be a source for local or national media, be cautious, but don’t dismiss it. Rachel Fradette, State News editor-in-chief. has been live on ESPN, CNN and NPR. She discussed their coverage and has given insight to what’s happening on campus. This kind of debrief is OK. Putting personal beliefs and biases into that would be detrimental to the journalist’s credibility. Fradette said she has to completely separate herself from being a student and to fully be a journalist. Encourage networking and learning opportunities from national and statewide media. East Lansing isn’t a place where we see national media on a regular basis. Work with them! Many will be happy to mentor young journalists. I have a friend who is a TV photojournalist for CNN. We took students down to the courthouse to meet him and his crew, see his gear and check out the satellite truck. The students loved this. Some professional journalists created a fund to help feed the State News staff during the sentencing. Don’t ignore the story and hope it goes away. Proceed with caution. Don’t discount a story that has the potential to be huge. 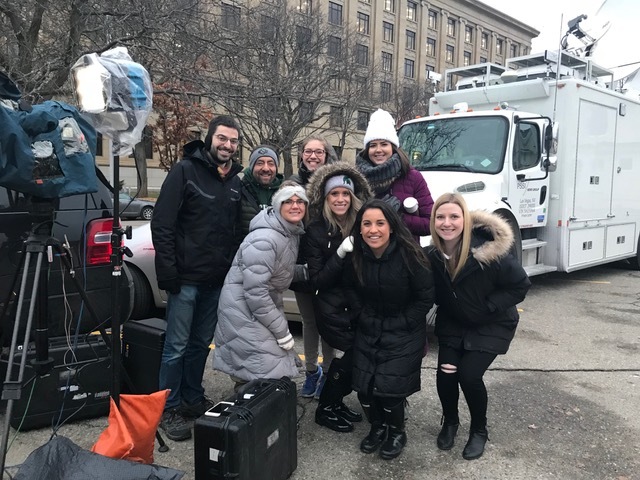 Gould’s students meet with the CNN camera crew in Lansing to cover the Larry Nassar criminal case. Photo by Bob Gould. 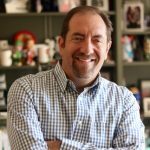 Bob Gould is a 1990 graduate of Michigan State University and is now in his 11th year teaching broadcast reporting and media law & ethics in the MSU School of Journalism after working 17 years in a television newsroom. He has been honored with more than 40 industry awards, most recently the “Robin F. Garland National Educator Award” from the National Press Photographers Association. Read what Gould learned from covering a case that was so close to home with student journalists.